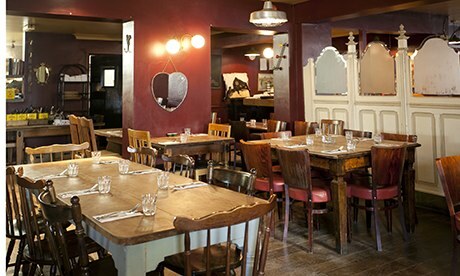 The Magdalen Arms: restaurant review | Jay Rayner - ( 1ND144 ) | Best Book "The Great Gatsby"
This is meant to be a review of a place in which to eat. In reality it will end up as a review of the pie we ate there. A bloody marvellous pie. So less a review than a love letter, written on paper scented with dripping. There are some people who, reading about this pie, will clench their fists and bang things. They will bellow that it is NOT A PIE, for that requires a pastry shell from top to bottom and around the sides. They write to me about this, these defenders of pie, with a fury out of all proportion to, well, most things. 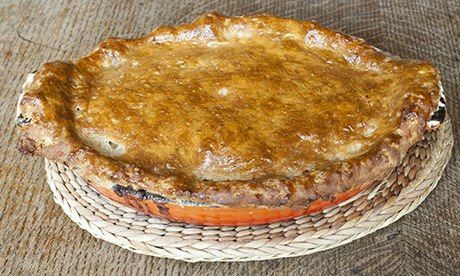 All I can say is that if you are the sort of person to get proper furious because I called a dish with a suet pastry lid a pie, then congratulations. You clearly have nothing more important to get cross about. But let’s leave the pie in the middle of the table for the moment, and consider the pub in which it is served. The Magdalen Arms – pronounce it how you wish; I merely have to type it – is a rare thing: a nice place to eat in Oxford. It’s a peculiar town, full of people who are brilliant at passing exams and some who happen to be clever, too. A few have book deals or research grants, or both. There’s money and lofty versions of taste, acquired or otherwise, and yet very few places in which to use any of it. It will take someone smarter than me to work out why this is; perhaps someone smart enough to be at Oxford. All of that makes the Magdalen Arms not just a nice gastropub but a public service, delivered through dishes which are sturdy and big boned, served on tables without tablecloths in a broad, low-ceilinged room. The walls are painted a deep claret which helps to make a functional space rather cosy on a damp November lunchtime. It serves beer and has a well-priced list of almost entirely French and Italian wines. What matters is its DNA. The current version of the Magdalen Arms is run by a former chef and a former manager from the Anchor and Hope in Waterloo, which in turn was born out of Fergus Henderson’s St John in Clerkenwell. The St John story is well known. Henderson, a trained architect with an architect’s love of white space, brought his cosmopolitan upbringing to bear on a few classic British traditions. He put roast bone marrow on the menu, and chitterlings and big, shiny-domed pies and is credited with reviving a whole category of British cookery. In truth he did nothing of the sort. He came up with a mythologised version which is far better than anything our great-grandparents ever got their rotting teeth around. To cook this sort of British food, you have first to be steeped in French technique. (Indeed, Henderson freely admits he got the bone marrow dish idea from watching the movie La Grande Bouffe with a whole bunch of other food pervs one wet afternoon in the Hampstead Everyman.) Throw in an Italian hankering for uncluttered plates and a taste for what Leopold Bloom in Ulysses called “the inner organs of beasts and fowls… which gave to his palate a fine tang of faintly scented urine” and a food cult is born. St John style food is now like nits in Year 4: bloody everywhere. I have seen the bone-marrow dish on menus from one end of this country to the other – even eaten it in Los Angeles. As a result, St John is arguably now a victim of its own huge success. Getting a table there used to require the thumb prints of three European popes. These days it’s much easier. After all, you don’t have to go to St John to eat St John’s food. You can go to Anchor and Hope, or Great Queen Street or Hereford Road. Or you can go to the Magdalen Arms in Oxford, where you can start with warm smoked herring, which could give its glossier and less-sustainable cousin smoked eel a serious run for its money. There is wood smoke and fish oils that mean business (but won’t make you clever; ignore the voodoo medicine) and to cut through it all, a potato and parsley salad with the poke of capers. There is thin-sliced “duck ham” with fat the colour of polished alabaster and meat the same shade of claret as the walls, all sent on its holidays to the Med courtesy of a fennel, olive and orange salad. And then there is the pie, served in a big enamelled cast iron dish. It costs £28 for two, but would serve three. The burnished suet crust is so shiny you can see your reflection in it. For a while we stare. It is one of those dishes that forces you into the present tense. The rain outside does not matter. We have pie. Finally I take a spoon to that suet crust and there is a crack; the sound that only a pastry made with animal fats will supply. Beneath, there are large pieces of beef that have been allowed to wallow in this ale-rich braising liquor for so long the strands are starting to wave each other goodbye. The gravy is serious. You cannot see your plate through a puddle of it. They bring us pots of mustard. We are lost in pie. Eating it becomes our shared endeavour. There are other things on the menu: short rib with celeriac purée, lamb faggots with split pea, turnip and mint, tagliatelle with forest mushrooms and garlic butter. But we always knew it would be the pie and that while we will eat other things it is the pie we will talk about later when asked how lunch was. There is a bowl of crunchy buttered greens. We eat some because we think we should. We do not finish it because that would fill up room that could be left for pie. We order sticky toffee pudding because the pie has earned its company. It’s a serviceable version, though towards the end a little dry, which is never a good thing with sticky toffee pudding. 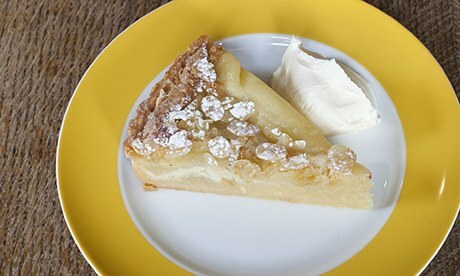 A pear and almond tart is equally fine. But my companion and I both know that they are not what lunch was about; that as we roll into the cab taking us away, all we will say to each other is, “Oof, that pie.’ And then we will sigh, happily.